Entities that Dasein encounters in its concern are called equipment, but Dasein is not thematically aware of this “equipmentality”. Rather, the nature of the encounter is termed readiness-to-hand. The important thing here is that the entities encountered are not simply brute-existent (present-at-hand) which are injected with the quality of readiness-to-hand by Dasein. This would imply that the entities are first encountered as present-at-hand and are later provided with the characteristics of readiness-to-hand. But Heidegger insists on maintaining the priority of readiness-to-hand. Heidegger introduces phenomenologically the concept of present-at-hand entities with the idea of unusability. When an entity presents itself as unusable (e.g. when it is damaged), its unreadiness-to-hand presents itself. Likewise when a utensil is missing for some project or when one obstructs the completion of a project, the unreadiness-to-hand is manifest. The unready-to-hand utensil, which is normally used to bring about the completion of a project, is suddenly unable to function in this way. When a hammer is broken, it immediately presents itself as incapable of hammering. Now, before the particular reason for the malfunction is observed, that is, at the moment when only its incapability for being used to further the project is noticed, then it is apparent that presence-at-hand lies behind the readiness-to-hand. This does not mean that presence-at-hand is more fundamental. A footnote to this sentence in the text explains that in the earlier editions of the book, the word for readiness-to-hand was used instead of that for presence-at-hand. Thus Heidegger, himself, must have thought that the thematic awareness of readiness-to-hand brings about the concept of presence-at-hand. If we again examine these concepts on the ontic level, we can more fully see the argument. All entities encountered in our concern are ready-to-hand instruments. Thus a pencil is seen as a writing implement – that which will serve to complete the project of writing. It can also be seen as a piece of wood that will burn, or a light object that can be thrown. No matter how it is encountered, it is seen as a utensil of some sort. One might argue that the idea that the pencil is the same thing in all of these situations is lost. But that is the point: the entity is a utensil, not a thing-in-itself. If an unreadiness-to-hand doesn’t appear (a broken pencil), then there is no awareness of the pencil as a thing other than its function in the given project. Of course we can reflect upon the single pencil as something to be used for many different projects, but it is still always in terms of some readiness-to-hand. When a pencil is perceived as broken, it is still perceived in a ready-to-hand way. It must be discarded, repaired, or ignored, but it always seen in terms of its readiness-to-hand. The question now arises, where does presence-at-hand come in? When we look at a rock, we see it as ready-to-hand. As soon as we see it as a “rock”, it is assigned to the referential totality of ready-to-hand entities. Jean-Paul Sartre in his novel, La Nausée, depicts Antoine Roquentin as overpowered with a feeling of nausea when he reflectively observes a root in a park. Roquentin becomes aware that there is something beyond the root as it is perceived in all of its referential connotations. However, I do not think that Roquentin is nauseated because he perceives the presence-at-hand of the root. Rather he is nauseated precisely because he can’t. No matter how he looks at the root, he is overwhelmed with the mental abyss staring at him when he tries to penetrate to the presence-at-hand of the root – the existence of which can be postulated but never perceived. Everything that is perceived, every situation, is perceived in terms of antecedents and consequences. This suggests Heidegger’s concernful Being of Dasein and the category of cause-and-effect for Kant. This quality of antecedents and consequences is characteristic of all human knowledge, because it is rooted in human perception. If the ready-to-hand entity is perceived in terms of antecedents and consequence, then this is the being constitutive of it. The pencil is seen in terms of making a blank piece of paper full of writing. The future situation of a paper full of writing dominates here. Here, however, I believe that temporality arises from the idea of the ready-to-hand. 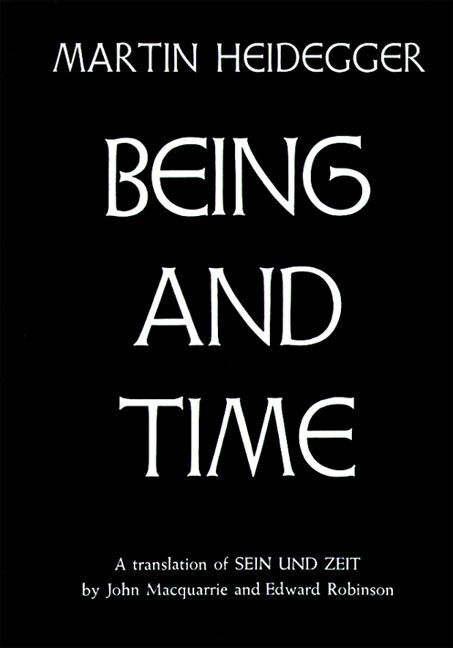 The thesis of temporality being constitutive of readiness-to-hand is entirely consistent with Heidegger’s conception of time (above). That is, the present is the past projecting into the future. This, however, is not consistent with our concepts of entities. Presence-at-hand is pure substantiality without the ascription of any properties, no matter now formal. All functional concepts are eventually relatable back to some sensory perception, whether it is the reading of a meter, hearing a buzzer, or seeing an image. This must be so in order to have experimental verification of scientific theories. As areas of knowledge become more sophisticated, they may seem to be more fundamental, but they all eventually go back to some empirical observation – this observation being exclusively of ready-to-hand entities. The physical theory is then a complex organizational framework of ready-to-hand things, and it, too, is ready-to-hand. As the quest for fundamental particles in physics becomes more and more sophisticated, it becomes increasingly evident that the theories are mere mathematical tools which seem to eliminate the need for the idea of a present-at-hand entity. That is, there are no longer discrete entities in modern theory, but just a vast space-time continuum with wave-like peaks and valleys which appear to be entities to our senses in the macroscopic world. This only indicates that present-at-hand entities are in no way necessary for physical speculation, even for "fundamental particles” of nature. Even physicists no longer believe that they are dealing with present-at-hand entities – that is what the “revolution in physics” is al about. Physical theories are seen only as mathematical interrelations of sets of data that are valid only in so far as their empirical predictability is successful. Thus physics and all other realms of knowledge are exclusively thought of in terms of the ready-to-hand. What, then, is presence-at-hand? It is a kind of dimension characteristic of utensils. Since it can only be phenomenologically approached by the observance of an unreadiness-to-hand, this idea seems justified. If all the readiness-to-hand were to be removed from an entity, we would have its presence-hand. This can only be thought of logically, since when a certain readiness-to-hand is seen absent from an entity (an unreadiness-to-hand appears), then a new and different readiness-to-hand will show itself to Dasein’s consciousness. If we were to reflect on the utensil, we could approach presence-at-hand as a logical limit by contemplating the removal of all readiness-to-hand. In precisely the same way the concept of infinity is a logical limit, that is, it’s sum can never really be conceived, but by successive addition of units, we can approach infinity as a limit. It seems quite possible that presence-at-hand is not unlike pure aesthetic speculation. This would suggest, if the foregoing is accepted, that pure aesthetic speculation, i.e. a purely aesthetic encounter of anything, is completely impossible, but that the idea may be approached as a limit. Thus he who pursues the aesthetic way of life can never really achieve a fully aesthetic experience, and thus full aesthetic satisfaction is impossible – only nausea is the result. The world seen as strictly utensils can lead to many ethical implications in view of the fact that the future dominates the outlook of the individual (“The Primary phenomenon of primordial and authentic temporality is the future.” ) The duty of man is then centered around projects that are continually set before him. Many of these implications are carried out in great detail by the Utilitarian philosophers, such as Dewey. The important point is that central to Heidegger’s thesis is the idea that entities of the world are all encountered as utensils, and this fact can override other less fundamental tenets when implications of his philosophy are being considered. Martin Heidegger, Being and Time (1927), translated by John Macquarrie and Edward Robinson (1962), Harper & Row, p. 96. Jean-Paul Sartre, La Nausée (1938), translated by Lloyd Alexander (1959), p. 174. Heidegger, op. cit., p. 374.